The morning video of the Truth Hounds from Avdiivka, 1, Haharina Str. The direct hit to the southern wall of the building, which led to the destruction of the concrete floor and knocking out of the concrete bearing blocks. Overall, three multi-storeyed buildings were damaged only for the time of evening shelling on February 16, 2017. One man dead having received a deadly wounded head injury. Another local resident was contused during the hit of the shell into the shop “Barvinok” on the 12, Haharina Str. 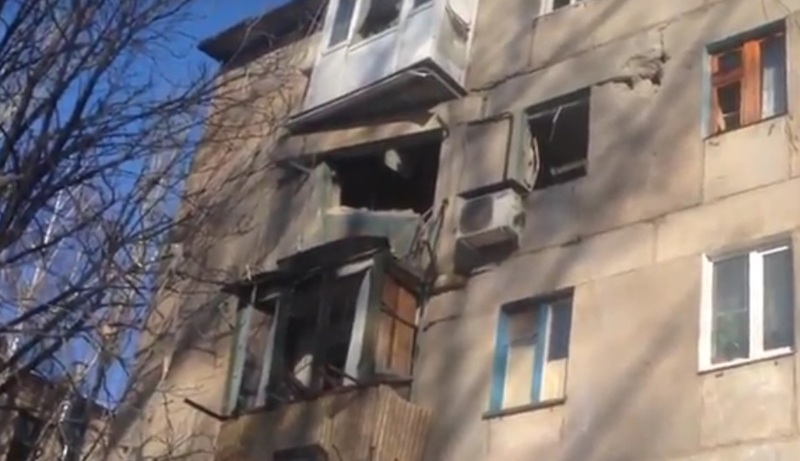 One more civilian received a trajectory foot injury while covering his child from an explosion of the shell, which hit the apartment number 10, building 1, block 9. The same explosion tore apart the heater in the next apartment. The boiling water burned a leg of the elderly apartment owner. This shelling could not bring any military advantage and can be classified as a war crime. All the details are documented.